We inform you that for a correct operation of the web www.fsantabarbara.com the navigation system uses some browsing data (“Cookies”) to be able to offer a more personalized service to the users of the web. “Cookies” are small text files that the browser saves when browsing web pages and applications. You can obtain the information of the IP address used by the computer to connect to the web page, the URL of the requested web page, the time of connection and other parameters related to the operating system of the user’s computer environment. This information is only collected to identify the session in order to facilitate the analysis of the website. Analytical Cookies: These are those of the service offered by Google Analytics; which is a web page statistics service offered by Google, Inc. Google Analytics collects information from the user’s computer to obtain reports on the activity of the application; saving information stored on servers in the United States. Cookies stored by Google Maps through interactive Google maps, which provide a useful way for web visitors, the location of the company’s facilities. They collect information from the user’s equipment to obtain reports on the activity of the application; saving information stored on servers in the United States. In any case, in the event that personal data is collected – in this case, only the IP of access; We inform you that these will be treated and incorporated into a File responsibility of FORJAS SANTA BARBARA SA. In accordance with the provisions of articles 15 and 16 of the Organic Law 15/1999 of December 13, Protection of Personal Data, we inform you that you can exercise the rights of access, rectification, cancellation and opposition in TXIKERRA SN 48340, AMOREBIETA-ETXANO (BIZKAIA). In any case, the user can enable the option of their own navigation system to not allow the installation of cookies; without under any circumstances FORJAS SANTA BARBARA SA may be responsible for the disabling of cookies that some of the services offered by this website does not work properly. In the following links, you will find instructions that will help you configure the settings of the most commonly used browsers. 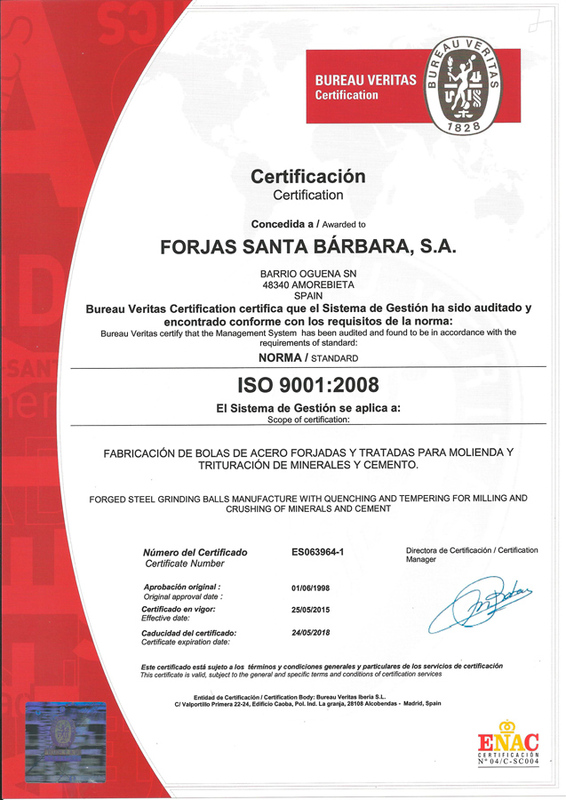 In case of doubt or any comment, you can contact FORJAS SANTA BARBARA SA through its means of customer service or communicate with us through forjas@fsantabarbara.com.